Personal Genomics: Gene Sequencing & Analysis in India. In recent times, the people of India have been heard talking about gene sequencing, gene editing, gene sequencing, and many other similar terms. It seems like, they are now getting introduced to the idea and principle behind personal genomics. What do you mean by Personal Genomics? Personal Genomics is the branch of genomics concerned with the sequencing, analysis, and interpretation of the genetic makeup of an individual. It can be done by employing different techniques, including single nucleotide polymorphism (SNP) analysis chips, or partial or full genome sequencing using gene sequencers (a device that can read the unique sequence of DNA of individuals). What is meant by Gene Sequencing? Genome sequencing is a process or method of figuring out the order of DNA nucleotides or bases in a human genome i.e. the order of Adenine(A), Cytosines(C), Guanines(G) and Thymine(T). A human genome is organized into approximately 20000 genes and is made up of over 3 billion of these nucleotides. What are the benefits of Gene Sequencing & Analysis? Based on one’s genetic makeup, the gene sequencing can provide information on all aspects related to genetic diseases and disorders. It can even tell about an individual’s physiology. It can also be used to predict or confirm a genetic disease. For example, Parents can determine if their baby will carry the gene for the disease and can be suggested a treatment to treat their children. 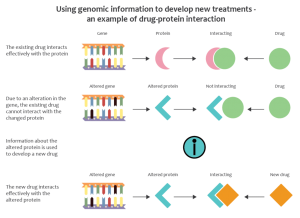 Using the genomic information to develop new treatments-above is an example of drug-protein interaction. Over the time new genes or mutations of known genes would be known through the use of gene sequencing. Such discoveries will be useful to design better drugs or some time to use a known drug in new ways. Gene Sequencing & analysis may also help in finding region-specific genetic variations. For instance, genetic variations unique to Indians that make them respond differently to certain drugs or make them vulnerable to certain diseases can be studied and cured. CSIR-Institute of Genomics & Integrative Biology (IGIB) is a premier Institute of Council of Scientific and Industrial Research (CSIR), engaged in research of national importance in the areas of genomics, molecular medicine, bioinformatics, proteomics, and environmental biotechnology. In December 2009, a team of Indian Scientists from the CSIR – IGIB decoded the genome of a 55-year-old man from Jharkhand. Now, Scientists of the same institute have organized a network of doctors called “GUARDIAN”. This network will help sequence genomes of individuals and families affected by a rare genetic disease. There are many new Biotech companies that are providing services related to personal genomics. In the recent future, it may be possible to request a gene test online. Genome Patri, a product marketed by a Hyderabad based company named MapMyGenome, offers an analysis of around 100 odd conditions and diseases. 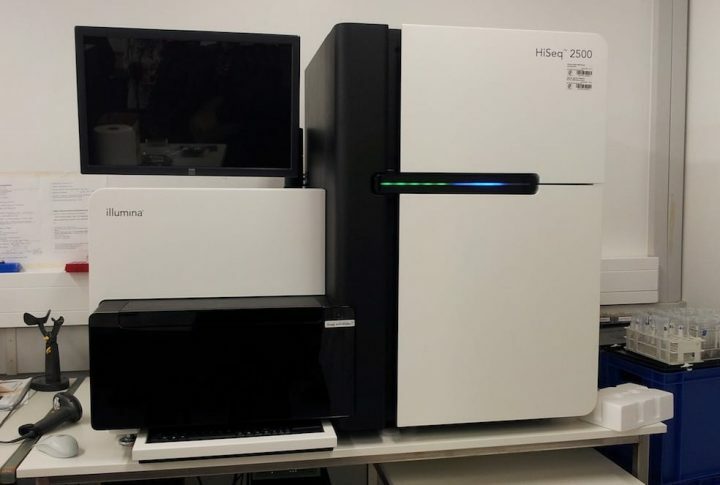 Medgenome, in Bengaluru, recently purchased a high-end genome sequencer (the only one its kind in Southeast Asia) for $12 million. Probably, they are gonna use it for the sequencing purposes. Strand Life Sciences (Bengaluru) develop a 152 gene test that will be made available to personal genomics test for determining disease risks in healthy individuals. iLifeSciences (Gurugram, Haryana) is a discovery and contract research organization in India, providing end to end services and solutions in the area of genomics, proteomics, cell biology integrated with bioinformatics. How much does it cost to have your genome sequenced? 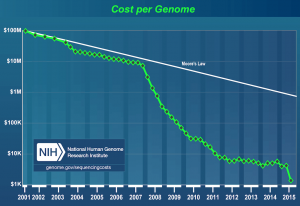 The costs of sequencing a genome have been drastically falling from almost $10 million to close to $ 100 today. The first human took $ 2.7 billion and 15 years to complete. Now, you can get your genome sequenced and analyzed for around $1400 in a couple of days. In India, the cost of sequencing and analyzing genome lies between 50,000 INR to around 2.5 lakh INR. Costs usually vary based on the quantity and quality of sequencing and analysis. Previous PostWhat are Megamasers? Why everyone is so excited about them?Next PostWhy is the Two-Kingdom Classification System Inadequate?